now allowing debit cards to be used with Apple’s mobile wallet. The bank sent out notifications to customers this morning. 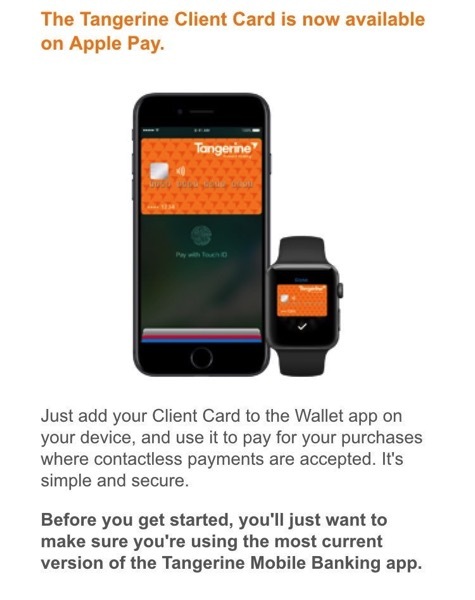 Previously, only Tangerine MasterCard credit cards were supported for Apple Pay. The addition of debit card support comes over 11 months after Apple Pay was first launched last August. 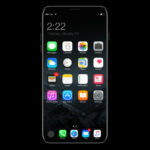 PC Financial launched credit card support for Apple Pay at the same time, but they have not added debit card support yet. Tangerine customers are being told to update to the latest version of the Tangerine Mobile Banking app to ensure they can verify Apple Pay for debit. Another verification method is by phone call. Back in May, we told you how Apple’s support document for Apple Pay briefly mentioned Interac debit card support for Tangerine, but was shortly taken down after. Guess that came true after all. Let us know how Apple Pay is working with your Tangerine debit card!